25490! Doubling nicely, although slightly slower, still a lot quicker than the expected 96 hours. I had another bit of a worry session this morning, felt perfectly fine, not even sore-chested. This will hopefully buy me a few more days’ relief. 9 more sleeps! Beta #3 just came in – 3356! Progesterone has climbed nicely as well. Things are looking great! Still doubling at about the 36 hour mark, which is wonderfully reassuring. After a long wait this afternoon, I am thrilled with a result of 552 for beta #2!! The guideline I’ve been given is that they like to see at least 100 on day 16. Today is day 15, and I’m already over that magic number. Of course it’s no guarantee, but I am feeling a little more secure. 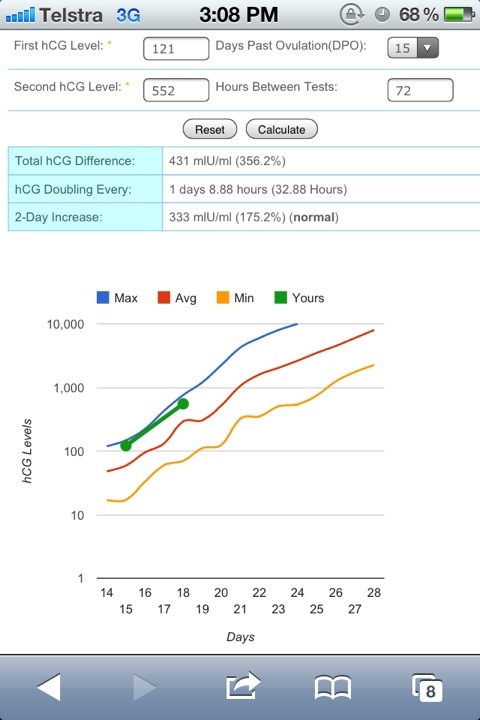 Oh, and for the other POAS junkies, I used a FRER, and counting back to when I saw my very first line, fainter than you can imagine, my HCG would have been at about the 22-25 mark. A lot higher than the 6.3 Google told me, and more like what the manufacturer said!